"Maybe you had to leave in order to really miss a place; maybe you had to travel to figure out how beloved your starting point was." Although TCKs tend to have a high level of cross-cultural awareness, they also have a concerning identity dilemma. TCKs live in a dichotomy of worlds. They identify with an abundance of cultures but yet they are unable to take full ownership of any. As they get older, questions such as ‘Who am I?’ and ‘Where is home?’ becoming increasingly difficult to answer. For a TCK, home is everywhere and nowhere at the same time. TCKs have little experience in domestic schools where peers do not fully appreciate their multicultural backgrounds. Often on repatriation to their ‘passport countries’, this can sometimes push them to the fringes of social groups where they are misunderstood or simply do not feel like they fit in. Perhaps unsurprisingly, it is common to find TCKs who possess a deep-rooted wanderlust. 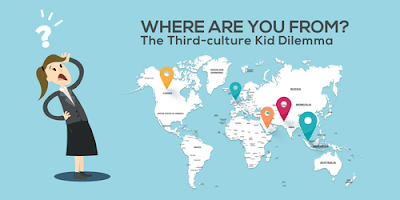 Third Culture Kids are Third Culture Kids for life. When they can recognise their own TCK behaviours, feelings and identity traits they are more likely to realise that they do in fact share a common ground with others. TCKs of all ages can manage their cross-cultural awareness and unique multicultural identities and use them to their advantage rather than a restraint, throughout life. So just remember, you are not the only one out there. There ARE people who feel just like you and know where you're coming from even though you yourself cannot explain where home is.